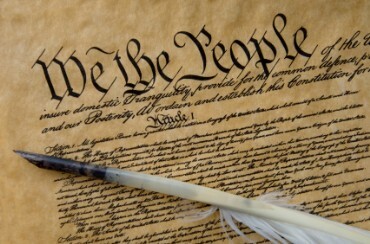 Why a Written Constitution is Important | What Would The Founders Think? Our national heritage is a written constitution that sets the rules for governance between the people and their elected representatives. If you’re given a fresh start to design a social contract based on reason, where the people hold political power, then you need to lay out the proposed constitution in writing so everyone can study, debate, and approve it. When Pilgrims landed at Plymouth, they almost immediately sat down and wrote a constitution called the Mayflower Compact. When our forefathers wanted independence, they felt a need to express their grievances and philosophy of government in a written Declaration of Independence. At the time of the Constitutional Convention, not only did all thirteen states have a written constitution, but most states had formal declarations of rights. Only through the written word can people exert their authority. They can argue over the composition, hash out differences, distribute it for comment and approval, and then constantly refer back to it. The United States Constitution didn’t spring forth from some committee for delegates to vote on without reading it. They read it over and over again and debated every word. Our Founders were serious men, with a serious purpose. During the convention, there were three iterations of the constitution, each one highly scrutinized. As a result, there were many changes and refinements between versions. Finally, the Committee of Style polished the text until it shined. After they got their work the way they wanted, they sent it out to the nation to be analyzed, debated, and ratified. Our Founders wouldn’t have spent so much time on the wording if they intended the Constitution be open to interpretation by whoever happened to be in office or on the court. They wanted it written down because words have meaning and they chose their words carefully. Some say that a document over two hundred years old cannot provide guidance in a diverse world of speedy travel, instant communication, deadly weapons, skewed wealth, and other modernity. This is a huge misconception. A misconception propagated by those who don’t want to be hemmed in by engineered constraints on the exercise of power. Think about it. Our Constitution isn’t a list of laws that can become obsolete. The United States Constitution defines the relationship of governmental powers to make, execute, and adjudicate laws. The system doesn’t need to change because laws respond to modern needs. The Founders wanted to bequeath to posterity a straightforward government that inhibited the abuse of power. Their written words remain clear. It’s the politicians who have skewed their meaning to do whatever they want. Most of the mischief can be attributed to three clauses. And promote the general welfare. The Founders never meant for these clauses to license unbridled national authority. Necessary and proper is clearly restricted to the enumerated powers. To regulate commerce meant the regulation of trade, not all economic activity. And the preamble does not bestow powers. They did the work of it. Are we not obliged to do the same for our children? Good comment. The base Constitution defines powers and checks on powers. In the first eight amendments, the people direct the government to never interfere with the listed rights. You are correct, the ninth amendment says there are unwritten rights, but it also says those rights are “retained by the people.” The problem with the Supreme Court discovering new rights in the first eight amendments is that it means rights are generously bequeath from a benevolent government. Whatever government gives, government can take away. If the government needs to be told to stay away from a right not clearly stated in the first eight amendments, I prefer the people add the right through the amendment process. I made much the same response to a liberal commenter on my blog, who snidely asked me how I knew so much about the Constitution. I said that it was written so EVERYONE could understand it (unlike Constitutional law, which nobody understands), and I referred her to a copy which I had earlier posted for downloading. Perhaps she actually looked at it.